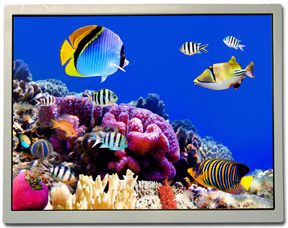 This 10.4″ XGA TFT LCD features luminance of 1300Cd/m2, and a 700:1 contrast ratio. It is ideal for outdoor applications. With the Advanced Wide Viewing (AWV) Technology, it achieves wide viewing angle of 85/85/85/85. It offers LED backlight with lifetime of 70K ours, and the constant current circuit for the LED backlight is built-in.